As you all probably know by now, Chase Ultimate Rewards points are my favorite credit card rewards currency. These points are exceptionally versatile and valuable. They are very easy to earn from big sign up bonuses as well as category purchase point multipliers (such as the Chase Freedom 5x categories). Ultimate Rewards points never expire. Ultimate Rewards points can also be shared with a spouse or significant other if you live at the same household address. 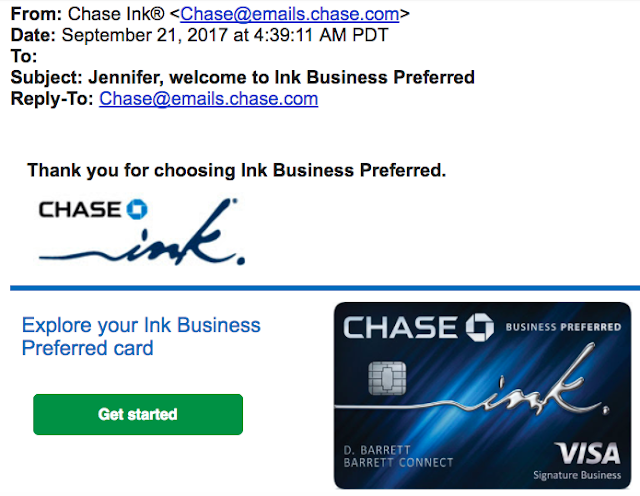 The Chase Ink Business Preferred card is currently offering 80,000 Ultimate Rewards points after getting approved and spending $5,000 within 3 months. This card offers 3x points on travel, shipping purchases, internet, cable and phone services, as well as advertising purchases made with social media sites and search engines. There are no foreign transaction fees for purchases made outside of the United States. The card does have a $95 annual fee, which is not waived the first year. Like most credit cards, the Ink Business Preferred offers trip cancellation and interruption insurance. The Ink Preferred also offers auto rental theft and collision damage when renting for business purposes. One unique benefit of this card is cell phone protection: you can get up to $600 per claim in cell phone protection against theft or damage when you pay your monthly cell phone bill with your Ink Preferred card ($100 deductible and maximum of 3 claims per year). Purchase protection coverage protects your new purchases for 120 days against damage or theft up to $10,000 per claim. Extended warranty protection extends your purchase manufacturer's warranty by an additional year. The Chase 5/24 rule was created to make it more difficult for credit card “churners” to frequently sign up for credit cards to get signup bonuses. With the 5/24 rule, Chase will deny your credit card application if you have opened 5 or more credit cards from any bank within the last 24 months. Even authorized user cards count under the 5/24 rule. There are ways to circumvent the authorized user issue such as removing the account from your credit report or speaking with a Chase customer service rep. There are a few Chase cards that are not subject to the 5/24 rule including the British Airways Visa, Hyatt Visa, IHG card, Marriot Business card and the Ritz Carlton Visa. However, once you get approved for those cards, they will add to your 5/24 count. Once we found out that my wife was no longer under the Chase 5/24 application restriction, we knew that her next credit card would be the Chase Ink Business Preferred card. She already has the Chase Freedom and Chase Sapphire Reserve cards. Since we own a rental property together, my wife’s business is being a property manager. Business credit cards allow you to keep personal and business expenses separate. This helps when doing taxes or adding up business write-off expenses. As long as you don’t default on your business credit, it will not have an impact on your personal credit rating. Since business credit cards are not reported to your personal credit report, they are not counted towards 5/24. If you are a business owner, you can apply for your business credit card with your business name and tax identification number. Many people are concerned about applying for business credit cards, especially if they don’t have an established business or LLC. There are many businesses that qualify for a business credit card. If you sell things online (eBay, Craigslist, etc), you are a sole proprietor of your own business. If you tutor as a side hustle, that’s a business. If you bring in any income on the side, that could potentially qualify your side hustle as a business. There is no need to apply for a business credit card under a legal name of business – you can apply as a sole proprietor and use your own social security number on the application. When you apply for a business credit card, it’s important that you are honest on your application. Do not make up a business name that you aren’t going to use. Don’t lie and over-inflate your annual business revenue. Most credit card companies want to approve you for a business card. You can get approved for a business credit card even if you are a sole proprietor and are making a small amount of annual revenue. Redeeming Ultimate Rewards points is extremely easy. You can redeem them for cash as a statement credit or deposited into your checking or savings account at a rate of 1 point equals 1 cent. You can redeem them for gift cards or shop with them at Amazon.com. You can redeem Ultimate Rewards points through the Chase Ultimate Rewards travel portal at a rate of 1.25 cents per point (or 1.5 cents per point with the Chase Sapphire Reserve card). The best redemption value of Ultimate Rewards points is usually achieved by transferring your points to one of the eleven Chase travel partners. These points transfer at a rate of 1 point equals 1 partner mile/point. Chase airline travel partners include: British Airways, Air France, Korean Air, Singapore Airlines, Southwest Airlines, United Airlines, and Virgin Airlines. Chase hotel travel partners include: IHG, Marriott, Ritz-Carlton, and Hyatt. We’ve transferred our Ultimate Rewards points into our Southwest, United, Singapore, and British Airways accounts many times already. Our best recent redemption of Ultimate Rewards points was towards free round trip flights to Japan from Los Angeles on Singapore Airlines Business Class. I wrote about our flight to Japan here and our flight back home here. Being able to experience premium air travel was a priceless experience for my family. It was such a great way to start and finish our vacation. We’ve also gifted our Ultimate Rewards points to family in the way of booking them free flights. 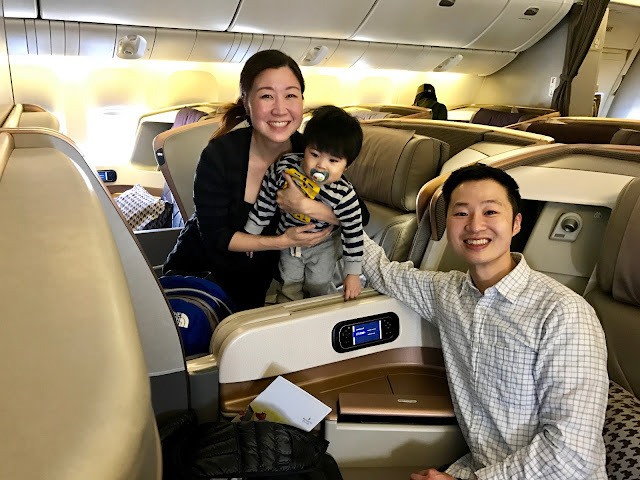 I recently booked my father free business class flights from Taiwan to Japan with British Airways Avios and from Japan to Los Angeles with Singapore Airlines KrisFlyer miles, all transferred from Ultimate Rewards points. He has never flown business class before and I know he will enjoy an amazing experience. You can book a 1-way flight from Los Angeles to Tokyo on Singapore Airlines Business Class for 85,000 KrisFlyer miles and $23.60. This is an 11.5 hour flight where you will be pampered the entire time with amazing service, delicious food and unlimited alcohol. Singapore Airlines Business Class seats convert to completely flat beds in the sky to help you get restful sleep on your flight. 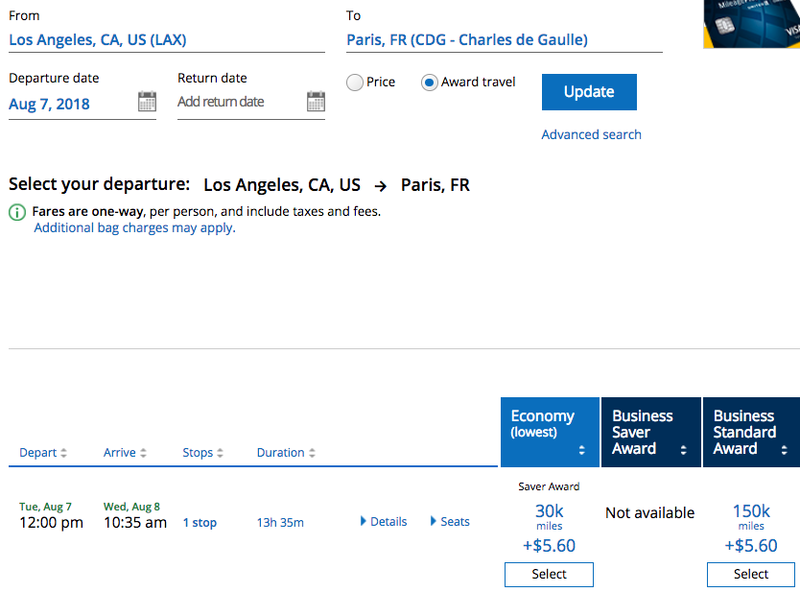 You can book two 1-way flights from Los Angeles to Paris on United Airlines for a total of 60,000 United miles and $11.20. You can book a one way domestic flight on Southwest Airlines for as little as 2,330 Southwest Rapid Rewards points during one of their frequent sales. An extra 80,000 points will be a welcome addition to our stash of points. With Chase Ultimate Rewards points, the possibilities are endless. You can use the points towards airfare, hotel stay, cash back, or even gift travel to your friends and family. Saving money on travel helps us live a rich life as we continue to strive towards financial freedom. You can sign up for your Ink Business Preferred card here (we will earn 20,000 points for the referral). I recommend checking your credit score for free with Credit Karma. You can refer Chase credit cards to others from the Chase Refer-A-Friend website here.